(Newser) – For the first time, a Chinese player has been selected in the NHL draft. Andong Song was chosen by the New York Islanders with the No. 172 pick in the draft today. The defenseman, who goes by the name "Misha," started playing hockey on a smaller-than-normal rink in Beijing when his mother was trying to find him a sport. Once his talent was spotted, his family moved to Canada and he quickly excelled when he began playing as a 10-year-old. 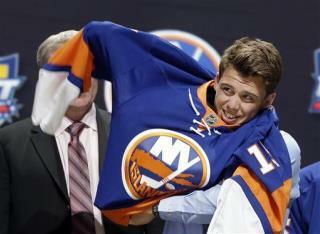 Now his pro rights belong to the Islanders, his selection broadcast live in China. "Feels like I'm a star already," said Andong, who was followed by a Chinese TV crew today. "It's a lot of pressure from people back home, but good pressure. I hope that will motivate me to become a better player and hopefully I'll make them proud." Watch out for prospect , Pass Mi Puck. He may have been born in China but this kid is in essence a Canadian. Let me know when someone in China is drafted from a Chinese league.